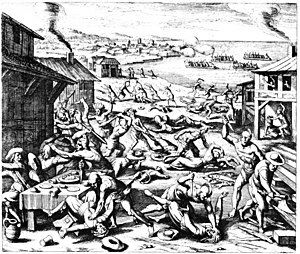 ^ Jamestown: Legacy of the Massacre of 1622. Americans at War. Macmillan Reference USA. Price, David A. "March 22, 1622: Skyfall", Love and Hate in Jamestown: John Smith, Pocahontas, and the Start of A New Nation. pp.200–221. Alfred A. Knopf. New York. 2003年. ISBN 0375415416. Rajtar, Steve. Indian War Sites. McFarland. Jefferson, North Carolina, United States. 1999年. ISBN 0786407107.